As the world’s ranks swell, population shifts have emerged as a major global challenge with potentially catastrophic implications. Endless debates over immigration rights have failed to produce the faintest hint of an acceptable solution. So perhaps an alternative approach would be to factor in an underlying basic law of chemistry. At the risk of gross oversimplification, what if we saw the flow of populations as the human equivalent of osmosis? In high-school chemistry we learned that, in a container of water divided into two halves by a semipermeable membrane, uneven concentrations of salt resulted in movement of water from the more dilute side to the side of greater concentration. The greater the discrepancy in solute concentration, be it a salt molecule or a complex plasma protein, the greater the force to equalise the concentrations. Now imagine the world as a giant vat subdivided into a number of smaller containers (nations) separated from each other by semipermeable membranes (borders). Instead of salt, provide each container with differing amounts of food, shelter and essential services. In this scenario, population flow from nation to nation will be a direct function of the degree of difference of goods, opportunities and hope. Arguments for the rights of nations to control their borders are a huge step in the wrong direction. We need to take a hard look at the disruptive dynamics of inequality. If this simple fact of chemistry (that lesser flows to greater) can’t penetrate the predominantly impermeable minds of policymakers, welcome to a world of escalating chaos. As we focus on reducing the gradients, we might recall that it was on this date in 1925 that the Butler Act, prohibiting the teaching of evolution in Tennessee classrooms, became law… paving the way for the Scopes “Monkey” Trial. Coming to a stadium in North London this Sunday: a tribute/replay of Monty Python’s “The Philosophers’ Football Match,” featuring Socrates Wanderers vs. Nietzsche Albion, all in support of the Philosophy Shop’s “Four Rs” campaign (a movement to get “reasoning” added to “reading, writing. and ‘rithmetic”). Great cause; great fun. 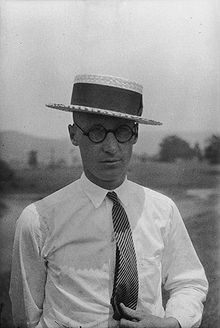 As we hear “Frege” and “Kant” exclaimed in response to a Yellow Card (…at least, that’s what it sounded like), we might recall that it was on this date in 1925 that John T. Scopes was served the warrant that led to his being the defendant in Scopes vs. The State of Tennessee (aka “the Scopes Monkey Trial”). Tennessee had responded to the urgings of William Bell Riley, head of the World’s Christian Fundamentals Association, and passed a law prohibiting the teaching of evolution– the Butler Act; in response, The American Civil Liberties Union offered to defend anyone accused of violating the Act. George Rappleyea, who managed several local mines, convinced a group of businessmen in Dayton, Tennessee, a town of 1,756, that the controversy of such a trial would give Dayton some much needed publicity. With their agreement, he called in his friend, the 24-year-old Scopes, who taught High School biology in the local school– and who agreed to be the test case. The rest is celebrity-filled history, and star-studded drama.